ADAPT Center's Research and Center director Dr. Fuqing Zhang is on taday's ( Tuesday, April 16, 2019 ) Penn State News . Article Title: Predictability limit: Scientists find bounds of weather forecasting. Center Graduate student Man-Yau (Joseph) Chan from Fuqing's group has been selected to receive the 2019 Hans Neuberger Award for excellent teaching of meteorology. This award is given to the top Teaching Assistant(s) for excellent teaching of meteorology at the elementary level. The fund was established in 1972 by the Penn State Meteorology faculty in honor of Professor Hans Neuberger, who guided the growth of the department over a period of 33 years from its embryonic beginnings to a position of world eminence. Professor Neuberger established excellence in teaching as a key element of that growth, and demonstrated that skill by his own example. Center Graduate student Robert Nystrom from Fuqing's group has been selected to receive the Al and Betty Blackadar Graduate Scholarship in Meteorology for 2018-2019. This scholarship is to recognize and provide financial assistance to Meteorology and Atmospheric Science graduate students who have achieved superior academic records or who manifest promise of outstanding academic success. Dr. Fuqing Zhang's JAS article on limits of weather predictability is featured in Science Magazine news release. Feb. 14, 2019 , 9:30 AM How far out can we forecast the weather? Scientists have a new answer. Topic: "Big Data Assimilation: A New Science for Weather Prediction and Beyond "
Abstract: i>This award is given to the top Teaching Assistant for exellent teaching of meteorology at the elementay level. Six other graduate students (Christopher Melhauser, Benjamin Green, Hans Chen, Junhong Wei, Erin Munsell, Robert Nystrom) in Fuqing's group have received this award. Director Prof. Fuqing Zhang receives the Penn State Faculty Scholar Medal in Physical Sciences for his pioneering work in data assimilation that has led to improvements in hurricane intensity forecasts. Graduate Hans Chen won the Outstanding Student Paper Award at the 20th Conference on Atmospheric Chemistry, American Meteorological Society (AMS) in January 2018 for his poster presentation: "Progress toward Estimating Surface Carbon Dioxide Fluxes at the Regional Scale Using an Augmented Ensemble Kalman Filter"
Graduate student Yue (Michael) Ying won the Best Student Presentation at the 22nd AMS IOAS-AOLS Conference in January 2018 for his oral presentation: "On the Selection of Localization Radius in Ensemble Filtering for Multiscale Quasigeostrophic Dynamics"
A special session on Multi-scale Atmospheric Predictability was held in 97th American Meteorological Society Annual Meeting. The program and recorded talks are available through the link. This award is to honor and recognize the outstanding research by a graduate student majoring in Meteorology. This award is given to the top Teaching Assistant for exellent teaching of meteorology at the elementay level. Five other graduate students (Christopher Melhauser, Benjamin Green, Hans Chen, Junhong Wei, Erin Munsell) in Fuqing's group have received this award. This award is given to the top Teaching Assistant for exellent teaching of meteorology at the elementay level. Four other graduate students (Christopher Melhauser, Benjamin Green, Hans Chen, Junhong Wei) in Fuqing's group have received this award. 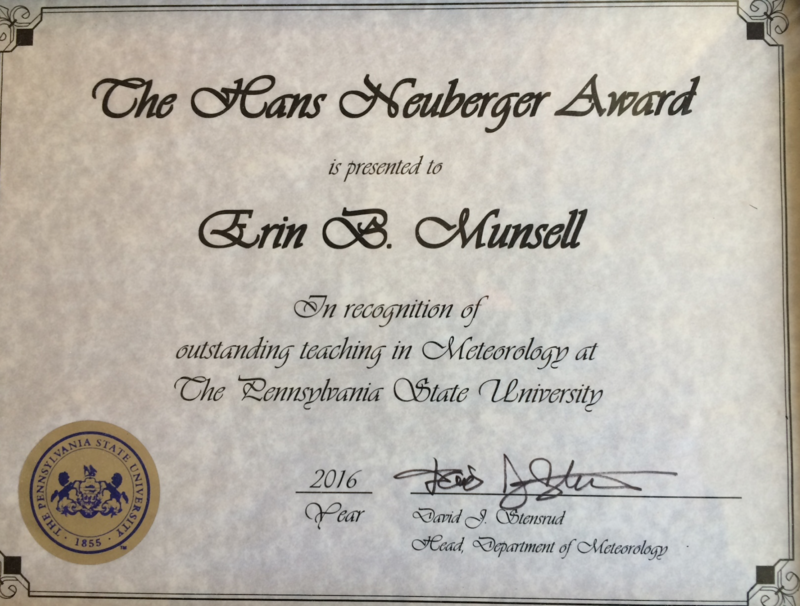 Graduate Student Erin Munsell from Dr. Fuqing Zhang's group is on Penn State News for her excellent research on Hurricanes. The research on GOES-R satellite data assimilation by Fuqing Zhang, Masashi Minamide and Eugene Clothiaux is on Penn State News. November 2015: members from Fuqing's group (Christopher Melhauser, Erin Munsell, Dandan Tao, Scott Sieron, Yonghui Weng and Fuqing Zhang) receive the NASA Group Achievement Award for their great job in the Hurricane and Severe Storm Sentinel (HS3) project. Visiting Graduate Student Yunji Zhang from Fuqing's group won the Student Presentation Competition: 1st Place Poster at 16th Conference on Mesoscale Processes. This award is given to the top Teaching Assistant for exellent teaching of meteorology at the elementay level. Three other graduate students (Christopher Melhauser, Benjamin Green, Hans Chen) in Fuqing's group have received this award. Dr. Zhang is being recognized "for his exceptional scientific contributions in the atmospheric sciences, specifically in the areas of atmospheric dynamics and predictability, data assimilation, and ensemble forecasting of tropical cyclones". This Award is given to an individual in recognition of research achievement that is, at least in part, aerological in character and concerns the observation, theory, and modeling of atmospheric motions on all scales. The Banner I. Miller Award is presented to Drs. Fuqing Zhang, Yonghui Weng, John Gamache and Frank Marks “For valuable insights into incorporating real-time airborne Doppler radar measurements via ensemble data assimilation, leading to improvements in forecasts of tropical cyclone track and intensity”. ADAPT Mini-Symposium in honor of Syukuro Manabe for his great contribution on climate science.